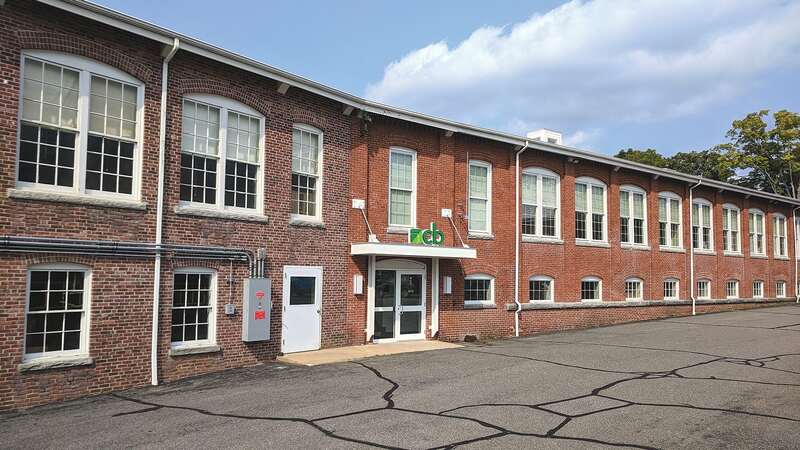 When Country Bank sought to overhaul its space on South Street in Ware a few years ago — a former mill building that houses about 110 employees — its leaders banked on what they call a collaborative culture, where low cubicles, glass walls, and comfortable, casual meeting spaces all aim to promote better communication and interaction, and a work environment that appeals to the young professionals that comprise the bank’s future. Walking down the wide main hallway of Country Bank’s headquarters in Ware, you notice certain things. The central, glass-walled café. Conference spaces with names like ‘Integrity Room’ and ‘Prosperity Room,’ reflecting the bank’s values. The occasional beach ball. It can be an icebreaker of sorts, he went on, as the roughly 110 employees who work in the former mill building on South Street — almost half of the entire Country Bank organization — don’t necessarily all know each other. But it’s also, well, kind of fun. While fun to kick around, Scully said, the balls also promote interaction, a concept which was, frankly, the driving force in a recent, multi-year renovation of Country Bank’s main office. It’s the reason cubicles were lowered, solid walls were replaced by glass, and some of the gathering spaces feature couches rather than traditional chairs. Scully had a catchy description of what the renovation aimed to reflect — “Google comes to Ware” — and explained why that type of culture is important. One of the casual meeting spaces at Country Bank, is meant to spur creative thinking in an informal setting. Like the low cubicles, the glass promotes more openness as well, Regin said. “They put me behind glass walls so they can keep an eye on me,” Scully joked, before noting that his office used to be tucked away in a corner, as opposed to its current spot at the end of that main hallway. “You never went there unless you had to. It didn’t do anything for collaboration, nor did it allow me really to be a part of things. Now, right here, at my desk, this is the hub. For this issue’s focus on banking and finance, BusinessWest paid a visit to Ware to learn how Country Bank is using its thoroughly 21st-century space — and several touches of fun that go well beyond the stray beach ball — to better position itself as an employer of choice at a time when competition is high for young talent. 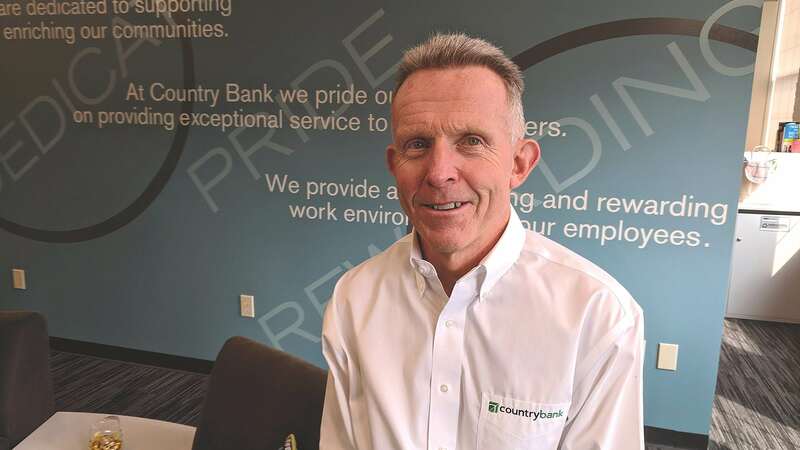 When Country Bank moved its headquarters in 2005 from Main Street to 44,000 square feet of former mill space on nearby South Street, it had options to relocate in another town, but the bank’s leaders felt it important to remain an economic engine in the community it had called home for more than 150 years. The first renovation, to make the space suitable for bank operations, took place 13 years ago, and included those high cubicles and some decidedly unattractive color schemes and décor. As opposed to 2005, however, the latest renovation, which began around 2015, took place while people were working in the building — and often shifting around to accommodate the changes. “I moved five times in a year,” Regin said. The renovation stretched over two years because of the need to work around each department. 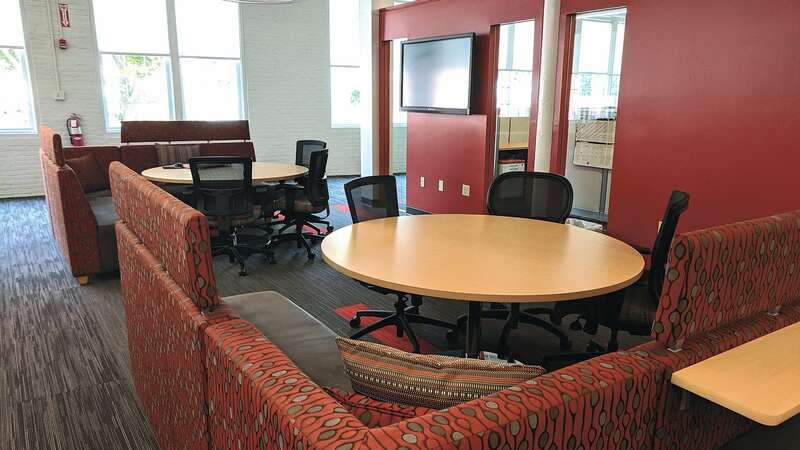 In addition to the collaborative elements, the building also features a conference center with state-of-the-art multi-media equipment, an expansive IT space, and a number of small activity rooms. A gym was considered at one point, but Scully worried that it might turn into wasted space if interest waned, and besides, there’s a gym around the corner that Country didn’t want to siphon business from. He had reservations about the central café as well, but that has proven to be a big hit. The fridge is stocked with fresh fruit all week, and Fridays feature a brunch with pastries or a yogurt bar. Then there are the Friday-morning games, like Hangman or Pictionary, that began with a few employees sneaking away from the brunch. Paul Scully says visitors are often surprised to see a bank based in an old mill building. So now, employees get an e-mail telling them what that Friday’s game is, and anyone is welcome to join in. It’s as much a way to get people talking and collaborating as are the small meeting spaces decked out with couches. If visitors and new employees are surprised by the culture being fostered inside the building, he added, the exterior can be unexpected, too. Banking, admittedly, has a staid reputation, and it’s not necessarily a field young people get excited about, he noted. But it is an industry where the culture is changing, and banks with an ear toward what Millennials prefer — when it comes to collaboration, flexibility, and even fun — will have an edge in attracting them.